I was too tired to get up this morning for my workout…sometimes sleep is more important! 🙂 I headed into work at 9 with an iced coffee in hand…it was much needed! The workday passed by quickly and was uneventful…sometimes that’s a good thing! I’m still sluggish though and a workout is just what I need! I’m off to whip up some banana oats and do some P90X yoga sort of workout DVD…just realized I don’t have my yoga mat here! 😦 I’ll have to see what’s on demand! Jillian Michaels will probably be the pick…or a run could take place! 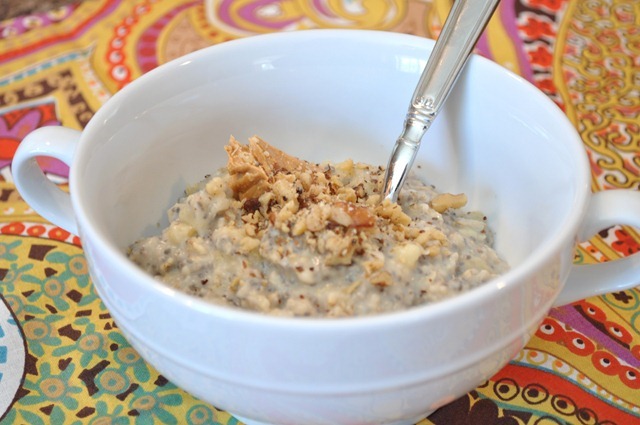 If you don’t think you like oatmeal, try this recipe (from Kath Eats Real Food)! I crave them now whereas before I had to choke down a bowl! So.good. And check out my guest post today on Errign’s Adventures! 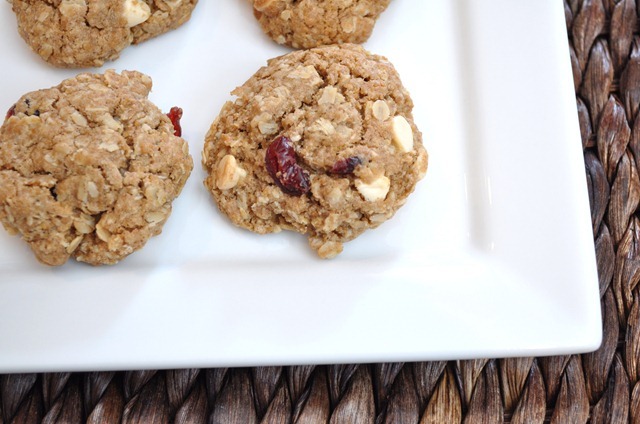 I share my favorite oatmeal cookie recipe and some healthier variations! 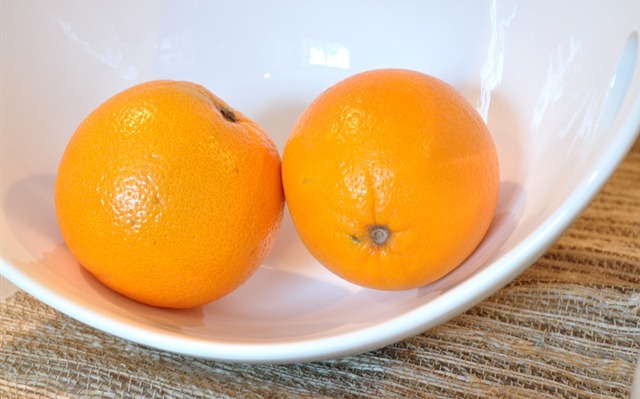 I have been obsessed with oranges lately, as I seem to be with most in-season fruits. They are just so juicy and refreshing this time of year and the one bright spot in the dull winter. I had a few sitting in the fridge that were a bit overripe so I started hunting down a recipe to use them up. I found a recipe for orange pound cake and pulled out all of the ingredients for it only to realize that I really didn’t want to make it. 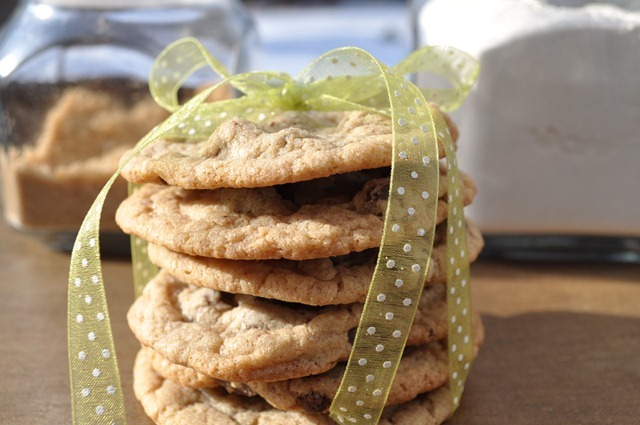 Next recipe…cookies! Easy enough for a quick treat! These cookies are amazing! Seriously. I was a little skeptical at first but the flavors compliment each other perfectly. 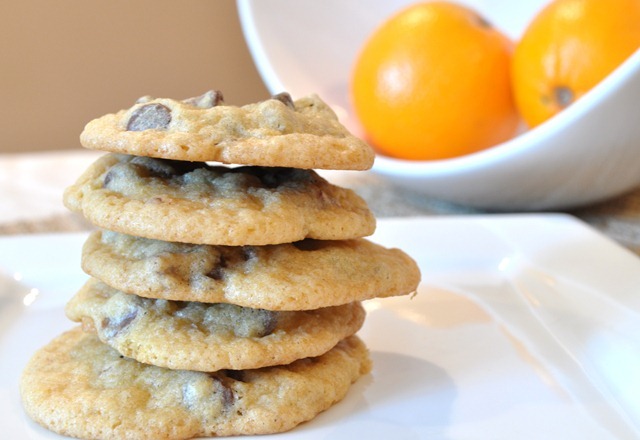 The orange zest gives them a nice citrus hint without being overpowering and the sweet chocolate and crunchy pecans make for an irresistible combination. In a medium mixing bowl, whisk together flour, baking powder and salt; set aside. 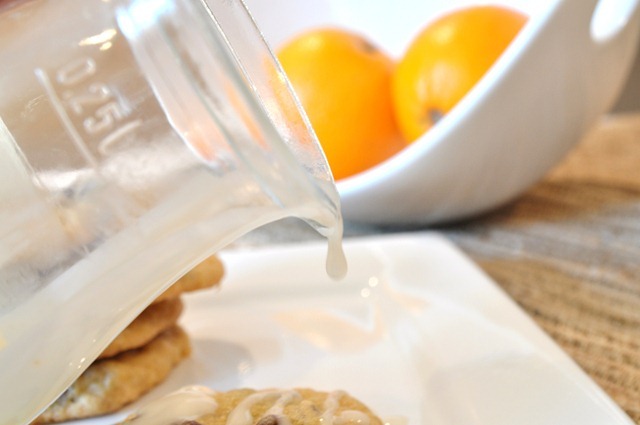 In the bowl of a stand mixer fitted with the paddle attachment, cream together the butter, sugars, orange zest and vanilla extract until light and fluffy. Add eggs one at a time, beating well after each one. Add dry ingredients and stir until combined. Stir in chocolate chips and pecans. If desired, refrigerate dough for about 15-20 minutes. 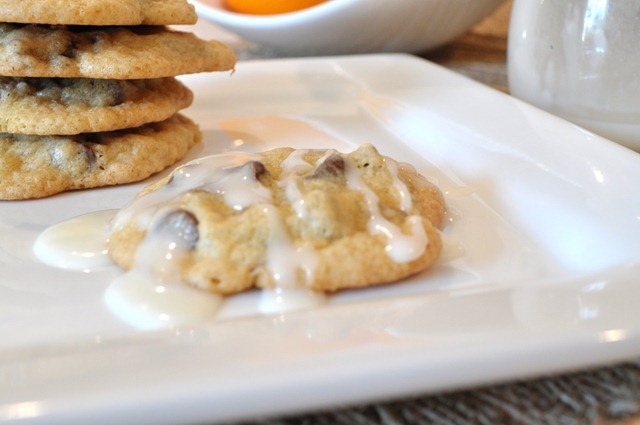 This will yield a slightly thicker cookie but is not necessary. 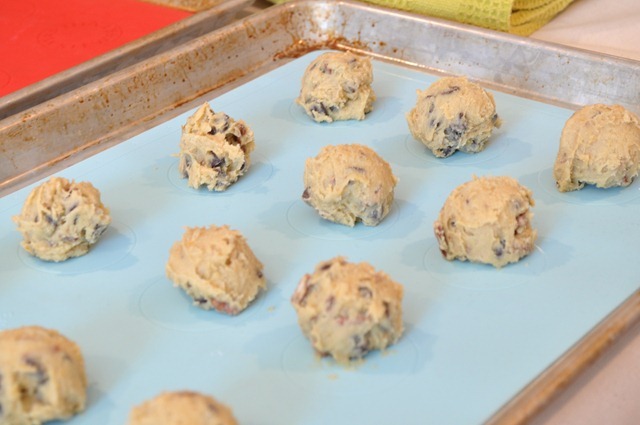 Drop onto cookie sheets using a small or medium cookie scoop or a tablespoon, about 2 inches apart. Bake for 10-12 minutes, or until golden brown. Allow to cool for a few minutes on cookie sheets, then transfer to wire racks. Don’t mind the pools of glaze…it’s an art to be able to photograph and pour at the same time…one I clearly haven’t mastered. This really enhanced the orange flavor! I just used the juice from an orange and mixed in powdered sugar until it reached my desired consistency. 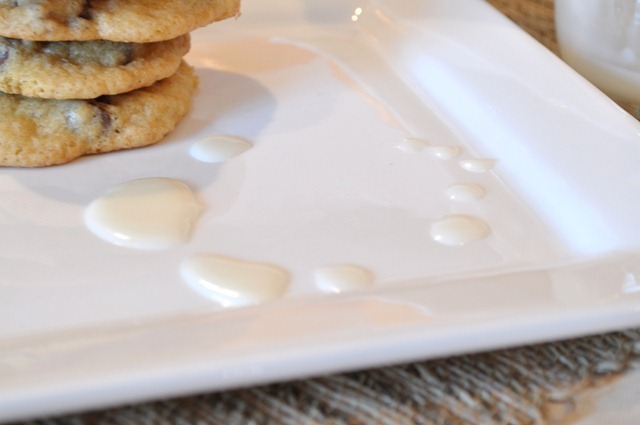 I really don’t have a go-to recipe for chocolate chip cookies so I’ve decided to try out a bunch to find “the one.” I was a little nervous when I saw how flat these got but they are actually very good. 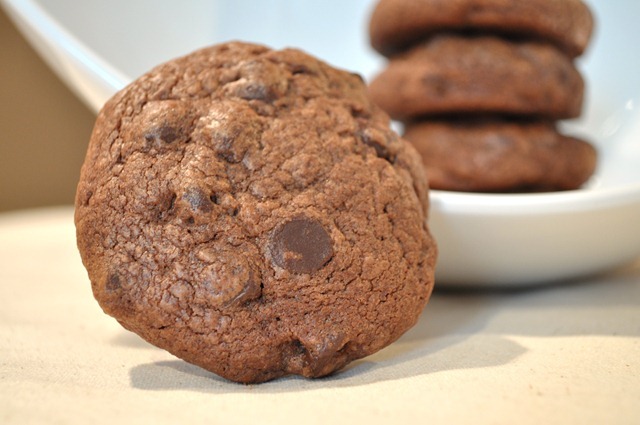 Don’t let the thinness fool you, they are amazingly chewy! 1 cup of butter, room temp. Preheat oven to 350 degrees. In the bowl of a stand mixer fitted with the paddle, cream together the butter, sugars, egg, and vanilla until combined. Scrape the sides of the bowl when necessary. 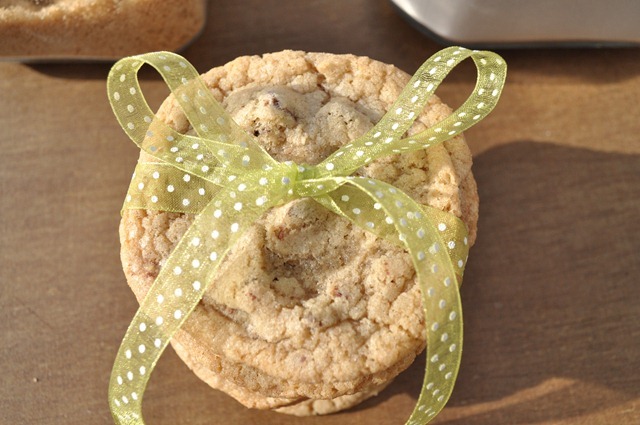 In a medium mixing bowl combine the flour, salt, baking powder, and baking soda. Whisk to blend. Add the dry mixture to the wet mixture and mix to combine. 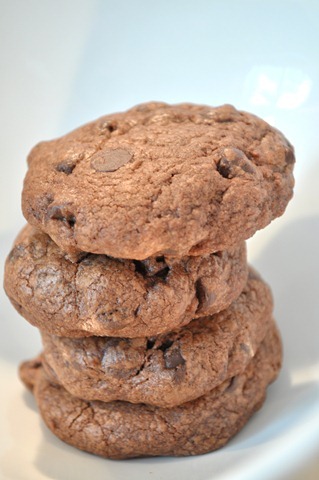 Add the chocolate chips and mix until incorporated. Scoop onto a parchment-lined baking sheet (I think I used a medium scoop), about 2 inches apart. Bake for 10-12 minutes, or until edges are lightly browned. Allow to sit for about 1 minute, then transfer to a wire rack to cool. I only baked half the batch and froze the rest of the dough in an air-tight container. 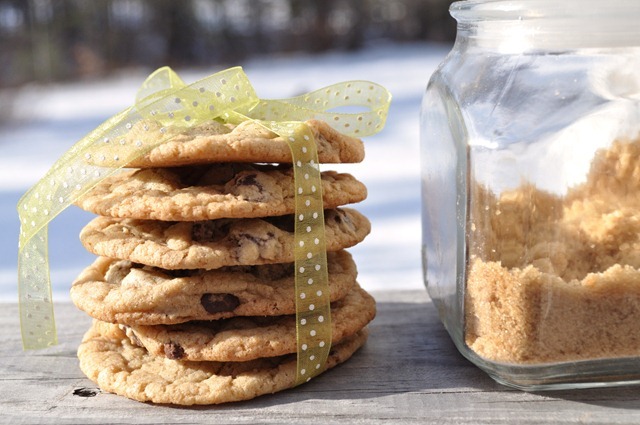 It seems we get sick of cookies pretty fast and end up throwing the old, crumbly ones away after a while. This way I have cookie dough ready to go in a pinch! I was, once again, browsing the web for a recipe. 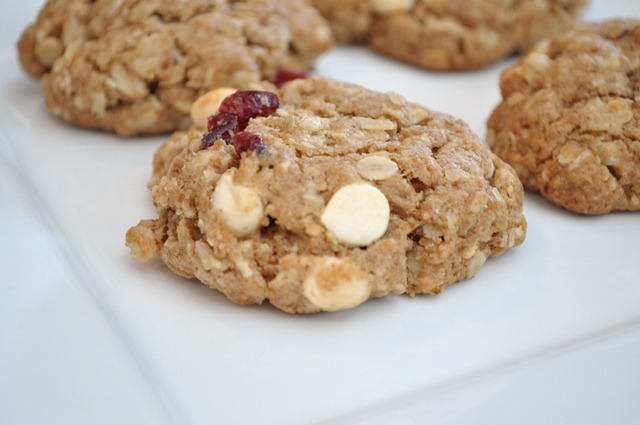 I usually look on Tastespotting or Foodgawker to find ideas since the recipes all have photos! I love seeing a picture of the finished product before I start. These looked delicious and did not disappoint! 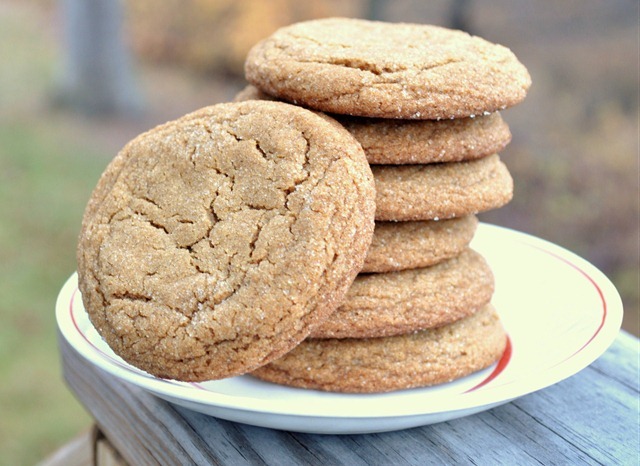 A little crisp on the outside and perfectly chewy on the inside, these gingersnaps just about melt in your mouth! 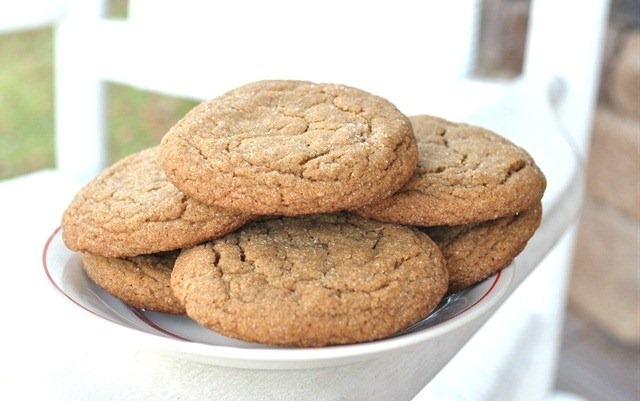 The mixture of spices, molasses and butter is truly amazing! Preheat oven to 375 degrees. In a large bowl combine the shortening, brown sugar, molasses, and egg. Once combined, add the remaining ingredients (except for the sugar to be used for coating) and mix well until a soft dough is formed. Roll dough into balls (I used about a tablespoon…or more… of dough for each cookie but you can make them as big or small as you please). Roll in sugar to coat and place on a cookie sheet lined with parchment paper, about 2 inches apart. 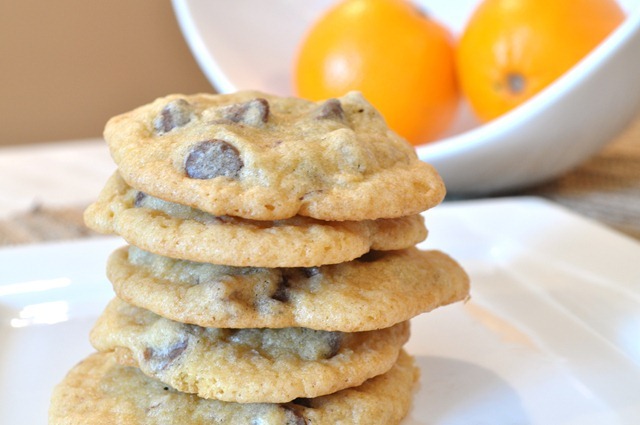 Bake for about 9-12 minutes, depending on the size of your cookies. 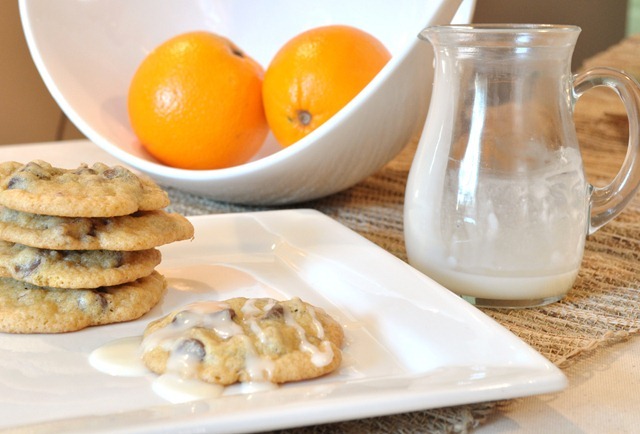 Enjoy with a cold glass of milk or a hot cup of coffee or tea! 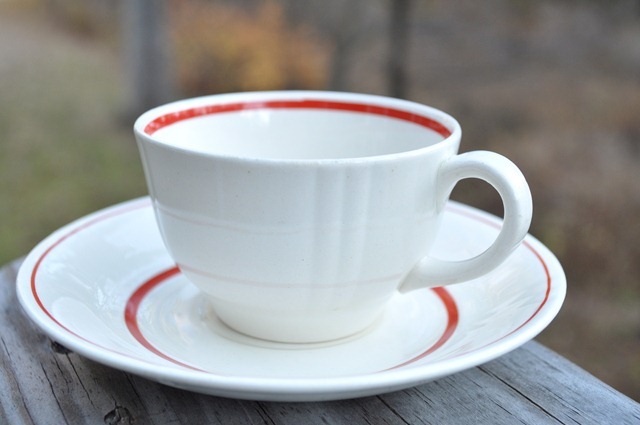 This set of cups and saucers was my grandmothers. My mom passed it on to me when I got married! It is from Finland and I absolutely love it!